Lindsey, the author, in her Preemptive Love t-shirt. Photo by MaryBeth Stewart. Two of my favorite things in the world are coffee and good conversation. I meet my friend Becky occasionally for both. On Friday, we sit across from each other in our favorite Des Moines cafe, steaming cups of Joe in hand, to discuss life and work. Becky shares with me about the anti-racism committee she is heading up at our church. It’s good and necessary work, she says. But it’s hard. Even harder than expected. She talks with me about the joys and challenges of leading a group of people through a journey toward racial justice in our city. I share with her about my work with Preemptive Love, and what it’s like to practice waging peace at the intersection of personal and professional spaces. We both speak to the struggles of community leadership at a time when communities are so polarized; when every issue brought to the table highlights the tension in the room. Every conversation about race or refugees or politics has the potential to draw out angry, hurtful words or push the participants farther into their own thought corners, away from one another, widening the already-present divide. It’s nice to have a kindred spirit – someone else who is wading through these sometimes treacherous waters of peacemaking in a country and community that want peace but struggle so much with the actual work of peacemaking. She leans back in her chair and takes a deep breath as if she actually received a blow to the stomach. I lean back in my own chair. Her words are like a gut punch to me too. Isn’t that the messy truth of it? To love anyway isn’t just to love the people who we feel deserve it most, or who are going to be grateful for the love we give, or who will be so impacted by our love that they’ll join us in the work of unmaking violence together. No matter what trenches you’re in, the real work of preemptive love is difficult and messy and complex. To love anyway is to love the most vulnerable people, but also to love the people who oppress them. To love anyway is to love the people who actively block our efforts to peacemaking. It means engaging the people who stand across the divide, not because we will earn their love back, but because we value their humanity. Because our journey to peace is bound up with theirs. My conversation with Becky reminds me that peacemaking is a big concept, but it’s the small stuff that truly moves us forward. It was a simple message on a t-shirt that caused Becky to consider what community reconciliation should really look like. And it was a conversation about that same shirt over a quick morning coffee that renewed my energy to keep looking for ways to love people preemptively in my own community—across the divides, including those who make the work harder and who I mostly just want to grumble about. The work of unmaking violence and waging peace is simply too much for one person to carry, and together we are so much greater than the sum of our parts. My hope for you is that you’ll find someone whose life or work you’d like to know more about, and invite them to join you in conversation. 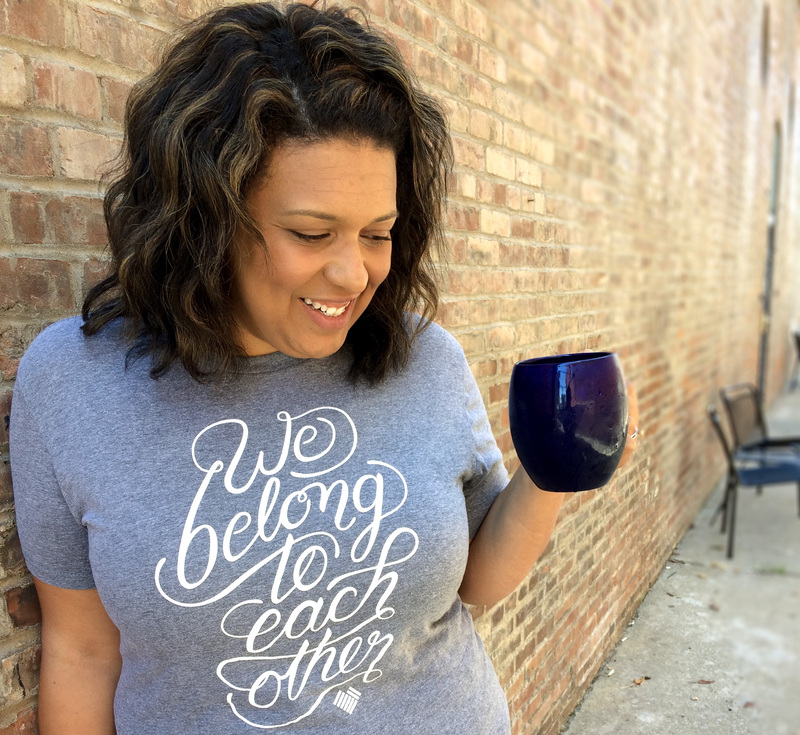 Like me, you may be surprised by the sacred conversations and lessons that emerge when you intentionally connect with a fellow peacemaker—or that person you’ve been grumbling about—over coffee.